If you spend enough time on pedestrian-only streets in North America, you will eventually experience the eerie emptiness that ensues when the pedestrians for whom cars were banned fail to show up. It happened to me recently on a stretch of Montreal’s Saint Catherine Street, part of which is closed to vehicles each summer, and is almost de rigueur any night on Ottawa’s Sparks Street, Canada’s longest-running failed experiment in car-free perambulation. Car-free urban spaces arose naturally in European towns where streets were too old and narrow for reasonable car access, and more dogmatically in North America, where in the 1960s pedestrian-only avenues became a sign of resistance against car culture and suburban malls. Dozens of auto-free zones were created over the next two decades; most have long since pulled up the bollards and let the cars back in. But in Buenos Aires, the city transportation authority believes that pedestrian streets are the way of the future. It has installed 80 blocks of them in the downtown area in the past five years, with another 20 blocks to follow by the end of the year. But there’s a catch: One lane of strictly local traffic is permitted, with a speed limit of 10 kilometres per hour. More importantly, the pedestrianized blocks – which feature extra-wide protected areas for those on foot – are part of a comprehensive strategy for managing the flow of people through the densest parts of the city. Buenos Aires’s Sustainable Mobility plan, which was put into action in 2009, gives a starring role to pedestrians and cyclists, but also includes a dramatic shift in public transport. 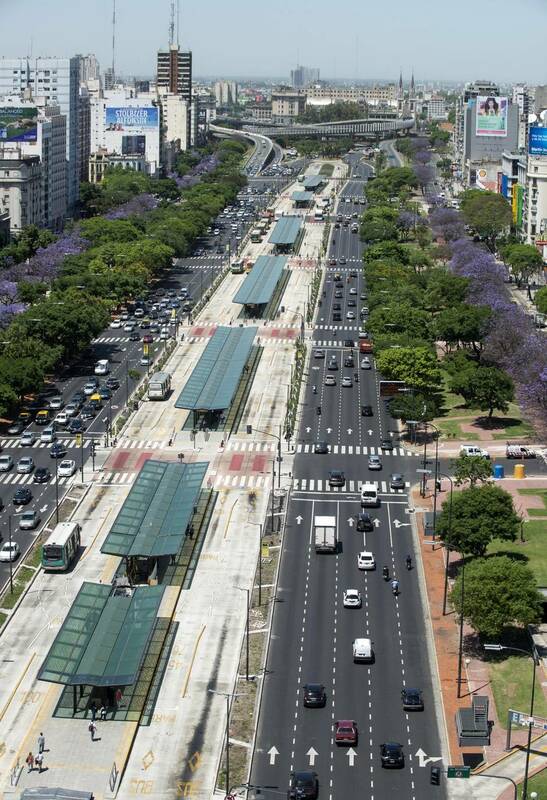 Four dedicated bus lanes were created in the middle of Avenida 9 de Julio, a vast urban highway that formerly channelled 20 lanes of car traffic through the downtown area. All of those speedier bus lanes, which have cut daily commuting times in half for 200,000 passengers, were shifted away from narrower streets that have now become pedestrian-friendly zones. The city has also created 145 kilometres of protected on-street bike lanes, and installed a free bike program that by the end of 2015 will have 3,000 bikes available at 200 automatic kiosks. Anyone can ride a bike for free in the downtown area on safe bike lanes – a revolutionary change in a city where until recently, cycling was purely recreational. “The idea is to take space away from cars and give more space to people,” says Guillermo Dietrich, the head of transport for Buenos Aires. The program has three goals, he says: to improve circulation, reduce pollution and make the city more liveable. “To improve quality of life in the city means improving public space,” he says. You can’t do that by giving priority to cars, he adds. Buenos Aires already had a long experience with pedestrianized streets. Portions of Calle Florida were first closed to vehicle traffic in 1911, and became a ped-mall in the modern sense 60 years later. But Dietrich says the street has struggled with the same kind of stagnation experienced by North American pedestrian routes, and was not planned with any wider view of the flow of people through the area. The cars that are allowed on the city’s pedestrianized routes must have permits for local residence or work, and you can’t get one if you don’t have your own parking space. The 10-km speed limit, Dietrich says, is based on the first speed limit for cars in London, England, where it was thought that the new horseless carriages should not be allowed to move much faster than the animals they displaced. He says the city was not swayed by the conventional wisdom that pedestrian zones only work in strong retail and nightlife zones. The greater concentration of pedestrians through the whole area is already starting to increase restaurant and residential development, he says, as parking lots are rededicated to other purposes. A look at the Buenos Aires experience immediately exposes the weakness of most North American attempts at pedestrianization: that they are too narrowly focused on a few blocks of one street, with little thought given to the broader ecology of public space and transport. There’s also a paucity of ideas whenever these streets run into trouble. One favourite solution is to spruce things up with planters and such, which was done last year along the four pedestrianized blocks of Ottawa’s Sparks Street. The other is to bring back the cars, a proposal most recently floated in Ottawa last spring by an advisory committee of the National Capital Commission (NCC), though a spokesman for NCC said that “the Sparks Street right-of-way … is under the jurisdiction of the City of Ottawa.” Cars or no cars: It’s like an on-off switch in many places, with little thought for a more tailored approach. Sparks Street has a unique set of problems. Over half of the properties are owned by Public Works and Government Services, which is not in the business of making lively streetscapes; another 16 per cent belongs to the NCC. The CBC’s 11-year-old Broadcast Centre has 200 feet of frontage on the mall and not a single door. The combination of government buildings, low commercial residency rates and harsh winters often make the street seem like a little bit of Detroit in the heart of our country’s capital. Sparks Street will not recover till more people live there, and it won’t be fixed simply by opening it to cars in the usual way. Sacramento reintroduced car traffic into its K Street Mall a few years ago, though the street’s two lanes were already occupied by light rail transit. Given how drivers usually feel about lining up behind fixed-lane transit vehicles, the move looked less like a creative response to the road’s decline than a sop to retailers who believed that more cars would mean more business. Guillermo Dietrich insists it’s people who bring in the business – people living and walking in the area. And he denies that something like the Buenos Aires Sustainable Mobility plan, which he expects will expand beyond the downtown area, is only possible in a city of three million. “It’s not true,” he says. “You can do this kind of transformation in small cities, too.” But you have to think big, even for a space only a few blocks long.